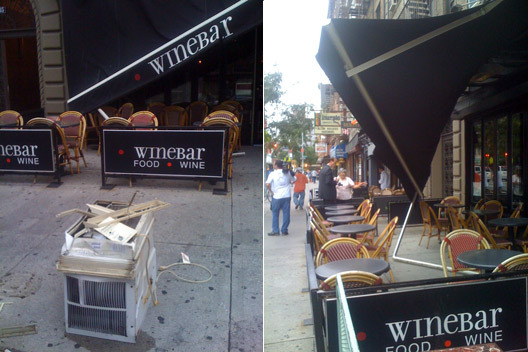 Word is spreading of an AC unit that tumbled six stories and landed on the Winebar canopy on Second Avenue at Fourth Street. The above photo is from Eater. Around 8:30 a.m. Tuesday, 67-year-old Tony Franzese was walking his dog as he does every morning. When an air conditioner fell out of a 6th floor window at 2nd Avenue and 3rd Street, it landed on an awning apparently bounced off and hit Franzese in the head. He suffered a severe head laceration and was taken to Bellevue Hospital. Carmen Barreto lived in the building for 38 years and told me her son helped clean blood off the victim. “He was very upset and nervous. He said ‘Ma, the air conditioner fall down onto the head’ and I said ‘My God he must be dead’,” she explained. “He sits here with the dog. He has a little glass of wine. He’s friends with the owner of the place here, and he’s a very nice man,” said resident Rachel Costa. I'm curious about what the legal ramifications are for something like this. Does the building get in trouble or the resident who put the a/c unit itself in? Just after 11 a.m., two police officers visited the resident who lives in the apartment from which the air conditioner fell out. The officers left about 20 minutes later. I live in the area and have a window AC unit that faces 2nd Ave exactly like that one. I'm always nervous its going to fall and hurt someone...there's really no practical way to put safety brackets in without a professional. I think landlords should be required to offer those services and should do checks to make sure all units comply. jeez.. that poor guy. hope he's allright. This seriously has been one of my biggest phobias in NY: an AC unit falling out and killing someone. I'm really surprised (and somewhat relieved) it doesn't happen more often. I hope they guy is okay--that's horrific. I blame the bike lane! I was walking past the scene around 10:15 or 10:30 this morning. Two men had just exited a car. One was saying that the owner thought it might show up on surveillance video, but wasn't sure yet. one of my least favorite blocks to walk on is the south side of 9th st. between 3rd and 4th aves. not only do you have to worry about the 9 million tilted window AC's leering up above, you also have to dodge the many manhole covers that might explode underfoot. My mother just got a new a/c and faced a lot of regulations about how to install it with the right kind of brackets that not only secure it, but ensure that the dripping is happening at the right angle so it doesn't ruin the outside of the building. The super made her call back the installation guys to do it the right way. I just bought a new product that would have prevented this. The AC Safety Net. It attaches above the AC and would catch it if it fell out or if the brackets gave way or are improperly installed. I have them for my house in the suburbs because I've dropped an AC out while installing it but I can see how they should be required in NYC.